Upon leaving Halifax we drove to Cape Breton. Here we are crossing the Causeway. We stopped for lunch at A and W in Port Hawkesbury. I had their new Beyond Burger (plant based protein) and it was very tasty. Rounding off my meal with onion rings and a root beer. Then back in the car to drive the "St. Peter's way" to Hillside on the Mira River. We stayed with Dave's parents and sister on their land neighbouring Dave's aunts' and uncles' land. We coordinated with the other cousins so everyone who isn't local was there all at the same time. And then everyone who does live in the area came out throughout the weekend to visit us. Q had a short nap while we did a little visiting and then while some people went to get some mussels, Q and I had supper. The rest of the crew eating dinner. Dave's sister's friends were travelling through Nova Scotia and spent a few nights with us. Poor Q never made it to the campfire, he tapped out around 7:00 pm each night and since he is such a good sleeper, we could go up to the campfire and know he didn't need us. Cousins getting the fire going. Dave scrubbing up the oysters they picked up along with the mussels. Now, we didn't have any fresh horseradish, but we did have lemons and I found ingredients for mignonette and it was all very classy out there on the folding table. A successful first night around the fire. The next morning E went to the Miner's Museum with Dave's sister and her friends. We were impressed that he wanted to go even though none of his cousins were going, and he really enjoyed himself. Dave, Q and I went to check out the Breton Brewing Company with Adam and Amy. Unfortunately their liquor licence does not allow minors so Dave and I had to take turns sitting outside with Q and our visions of enjoying a relaxing pint or flight were not realized. But we were still happy we went and picked up a few cans and a shirt for me. Q did not want to nap when we got home so eventually we just went up the hill to play and eat some chips. Then there was some rocket building. We had some local crab for supper. It was so tasty, but rich, and although there was extra, I couldn't eat anymore. E enjoyed hammering the crab legs and sucking the meat out of them. Q went right to sleep after supper, so we did some visiting around with everyone. I tried out the new slack line. And E played some board games in the "Kids Only" club house. The next morning since I was up early with Q, we walked up the hill to visit with Lindsay and A (1 years old) who were also up early. Dave went for a run with the other boys. Just casually stretching when he got back. For my part, I went for a run on my own although it was pretty hot, I'm glad I went. And more glad to be able to jump in the water for a swim when I got back. We did some swimming and then had lunch. ON this day, Q did have an afternoon nap, so I was able to read my book and have a little nap myself in the lawn chair. Meanwhile Dave and the boys were setting off rockets in the field. After Q got up we took a quick trip to get an ice cream cone and then into the water to cool off. E tried out the paddleboard. Another night around the fire. On Saturday morning, we spent most of the time down by the water. In the afternoon everyone came out and the kids did a pirate treasure hunt and then we did some family photos. Our part of the family. The whole crew. These are the descendants of Angus and Hazel and we were only missing a few people. Thanks so much to everyone who came out to make this photo happen. We're exhausted, can you tell?! This photo is out of order and I'm not sure where it fits in but I'm including it because E looks so tired in this photo. He only has one speed throughout the day and it's maximum effort, so when he finally sits down he's ready to pass out. On Saturday night the kids played soccer and had a water balloon fight on the hill. The young cousins all left on Sunday morning, which was a good day for a drive since it was rainy. We kept ourselves entertained. Dave had to take the rental car back in the afternoon and so I took Q down to the water to distract him that Dad had left. He waded in and out of the water until it was time to go up for lunch. We ordered some take out donairs, fried chicken and fries. So greasy but so good! For once I think I can say there were too many fries. After Q had a nap (!) we went across the river to visit some friends of Dave's parents. We usually go over to visit this group, and the kids had some fun together in the water and out. Monday morning had the most flat water so I grabbed the opportunity to go out on the paddle board. Dave came down to get these photos. I included them all since the views are so pretty. This cutie was there too. We finished packing up our stuff, had some sandwiches, and got ready to go. Our flight was delayed so we had to kill some extra time. We picked a few blueberries. We stopped by a Subway to pick up some food for the plane (which turned out to be a great idea since there were a few more delays due to the weather in Toronto, and the food cart took forever to get to us, without the subs to eat, we would have some meltdowns, and I don't mean the kids!). We said good bye to Dave's parents, sister, and aunt and headed back to Toronto. 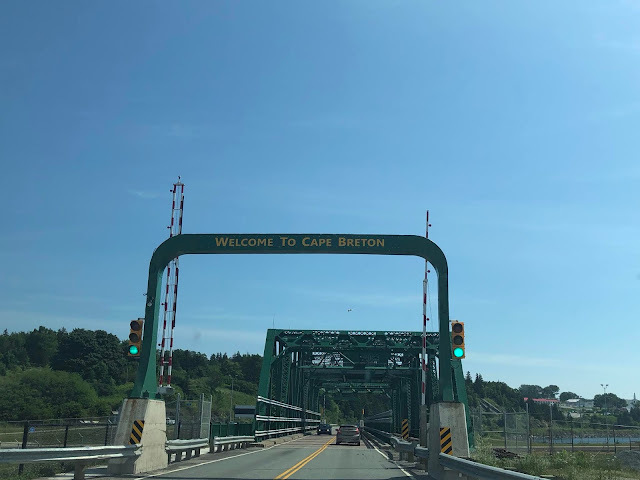 Always lots of good memories made in Cape Breton. See some photos from our past trips to Cape Breton here and our trip in 2016 here. 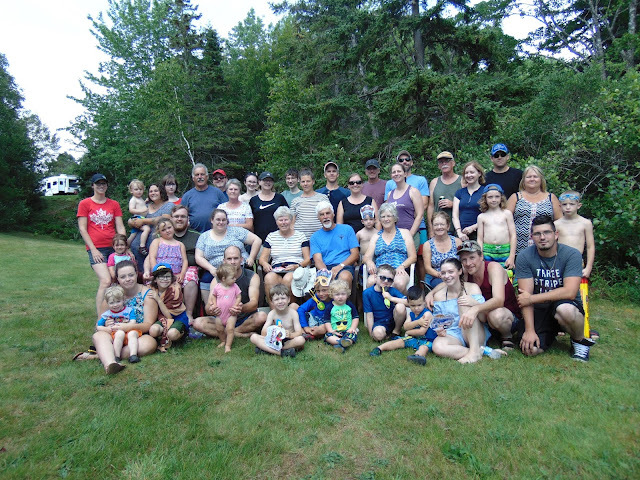 Enjoy seeing all the fun you had with the clan in Cape Breton! What a lot of great photos! great pics Sarah , we all had a great week so nice to see you,Dave and the boys,cliff and carol will be leaving on thursday .....my oh my the hill will be so quiet .